It was an "all-electric" fiery cross that led the Ku Klux Klan parade in Livingston, Wisconsin on August 2, 1924. The Livingston Band followed Klanswomen carrying flags. Behind the band, 82 Klansmen marched in full hooded regalia. A large crowd, estimated at 2,500 came out to cheer and listen to a speech by a "Dr. Stout of Detroit, Mich." Ira Stout was the Kleagle (leader) of the Detroit Ku Klux Klan. The meeting started with the band’s rendition of On Wisconsin, followed by the Lord’s Prayer. Stout said the Klan never bothered other creeds, "but we're fighting their system." He said the Klan was cleaning up the "booze evil." As his speech concluded a large cross was set afire while the astounded townsfolk watched and cheered. It was a typically theatrical Klan rally. Years later (1968) a witness to the rally recalled: “Many of those in attendance were there only for the curiosity and were not Klansmen. The speech was an attack on the three K's the "Koons", the "Kikes", and the "Katholics". Many of the people who heard the speech were repelled by the speaker's remarks and left the meeting quietly before it was over.” Contemporary accounts show no such reaction by the townspeople. 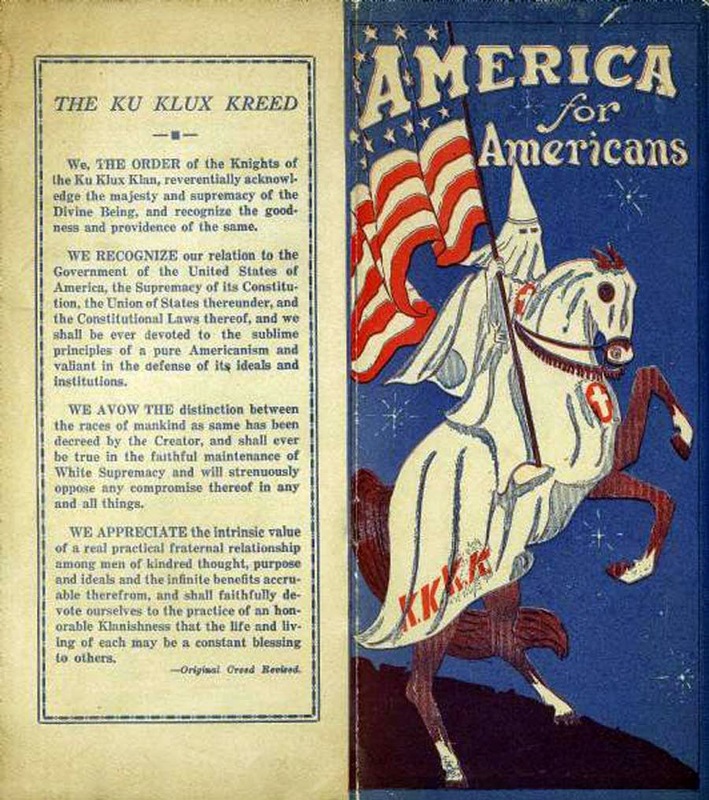 In the early 1920's the Ku Klux Klan was an organization on the rise, touting what they called "Pure Americanism." In fact they were a hate group, which, like so many others used patriotic themes to wrap bigotry and hate in. In the south racial hatred was still the main theme, but as the Klan moved north, they emphasized hatred of immigrants, Catholics and Jews. They used pageantry, theater and color to draw the curious and slander their enemies. They ingratiated themselves with the local citizens by contributing small sums to churches and charitable organizations. For example the local news section of a newspaper in Richland County reported: “During church services Tuesday evening a number of Klansmen entered the church remaining near the entrance while one walked to the platform and presented Rev. Pfaffman with a sum of money and a letter of thanks for his interest here.” A small town community building financial ledger reads “March 3, 1928. Received from the Ku Klux Klan five dollars” The Richland Observer of October 28, 1926 gives another example: “The order of the knights of the Ku Klux Klan gave an oyster supper in honor of their friends and neighbor, Rev. J. C. Hatch, Friday evening. The table decorations consisted of a large American flag. Supper was served to nearly one hundred.” Many were fooled by the Klan’s pretensions to patriotism and Christianity. Many were not. Wisconsin's governor, John Blaine, who hailed from Boscobel, was one of those who were not fooled, and he was a vehement opponent of The Klan. Blaine was first elected Governor in 1920. In 1921 citizens of Milwaukee and Kenosha petitioned the governor asking that he take steps to prevent the Ku Klux Klan from taking root in Wisconsin. “With such a record as the Ku Klux Klan had during the period following the Civil War,” he said, “and steeped in crime as the Klan was, do you think that any liberty loving, law abiding sensible citizen of Wisconsin is going to join an order that is alleged to be the counterpart of the Klan of rebel days, if in fact it is?” He was to discover that a large number of Wisconsin citizens would take the bait and join. Because of Blaine’s “unalterable opposition” the Klan was determined to defeat him in either the primary or general elections of 1924. They had their grievances against Blaine. He had refused the support of the Klan and instead denounced them when his opponent in the 1922 election wrongly stated that he was supported by the Klan. He had refused them the right to use public property for rallies. He declared that as long as he was governor "state property will not be used by any organization which suppresses the identity of its membership, or permits the masking of its officers and members operating in the dark or otherwise…I have through executive orders and communications and through campaign speeches let the people of the state know my stand against this organization and similar organizations." Both of the major political parties adopted platforms opposing the Klan in 1924. The Democratic State Platform read: “We pledge the Democratic Party to oppose any effort on the part of the Ku Klux Klan or any organization to interfere with the religious liberty or political freedom of any citizen or to limit the civic rights of any citizen or body of citizens because of religion, birthplace or racial origin.” The Republican platform proclaimed “We are opposed to the Ku Klux Klan or any organization that would deny to any citizen the free exercise of those sacred rights because of race, nationality, language or religious belief. The reality was often at variance with these pronouncements as many candidates were more than happy to speak before the Klan and accept its money and influential support. In 1924 the Klan threw considerable support to Governor Blaine’s primary opponent, Arthur R. Hirst. In the summer of 1924 small blue buttons reading “Back to Boscobel” began to appear all over the state. By August, the press was reporting that it was the Ku Klux Klan that was distributing the buttons to show opposition to Blaine. 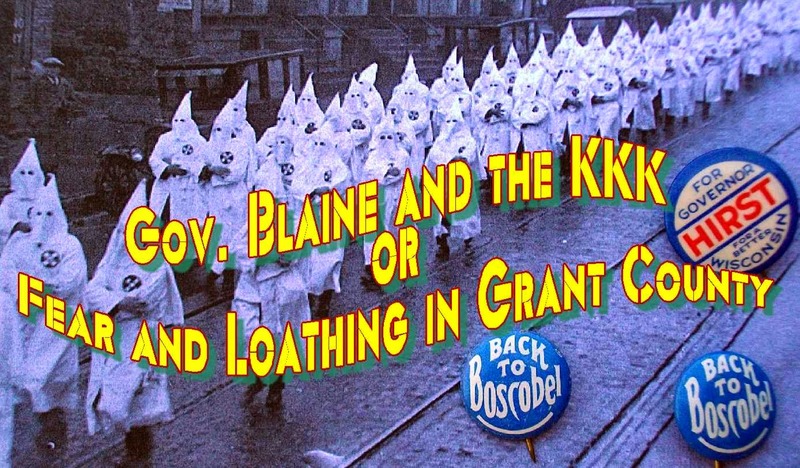 The Klan was also planning a visit to Blaine’s home town. On August 6, 1924 the Madison Capital Times reported that the Milwaukee headquarters of the Klan was negotiating with the Milwaukee Road to charter a special train to carry Klansmen from Madison to Boscobel on August 15th to march in the streets as part of the “Back to Boscobel” movement. The editor of the Progressive, reporting the sticker placing wrote: “if there are any “deadbeats,” “bootleggers” and “women-chasers” in Muscoda that don’t belong to the Klan, we don’t know about it. From inquiry in other towns in this neighborhood we find the same thing is true.” Tempers were heating up, and the fuel was about to be cast on the fire.